Delhi CET 2019: Delhi CET is a state level exam; it is also called as Delhi Polytechnic exam. D.CET 2019 will be organized by the Department of Training and Technical Education, Delhi. Delhi CET will be organized next year to offer admission in various full-time diploma courses in the field of engineering, technology, pharmacy, etc. Admission will be given in various government and private polytechnic colleges of Delhi. These colleges require CET Delhi scores. Through this article, we are trying to provide all the basic information about Delhi CET including exam dates, application form, eligibility, pattern etc. All the Interested candidates need to fulfill the Delhi CET 2019 eligibility Criteria, which are listed below according to their courses. Engineering, Technology, Fashion Design, etc. based Diploma Courses Test-1 Passed 10th or equivalent exam with minimum 35% marks in Science, Mathematics & English subjects. Modern Office Practice (English) Test-2 Passed 10+2 or equivalent exam with minimum 45% marks (and 40% for SC/ST) in the best three subjects including English. Modern Office Practice (Hindi) Test-3 Passed 12th or equivalent exam with minimum 45% marks (and 40% for SC/ST) in the best three subjects including Hindi/Sanskrit. Pharmacy Test-4 Passed 12th or equivalent exam with physics, chemistry, biology/mathematics subjects with 45% marks (40% for SC/ST) in the above subjects. Passed analogous 12th vocational engineering stream. 10th or equivalent passed with 2years ITI (Engineering) from ITIs/ITCs. Must have obtained 60% marks. 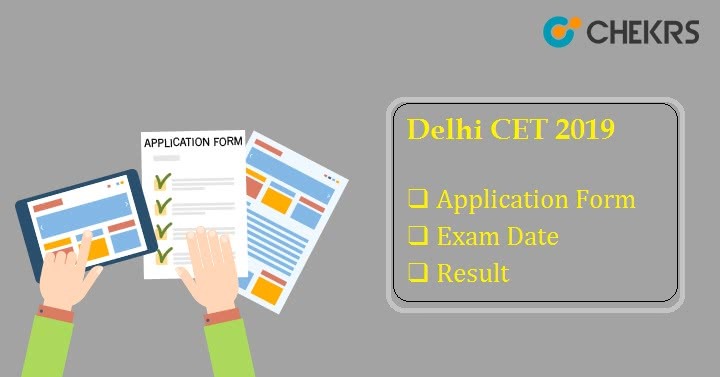 If you are eligible for the Delhi CET 2019 you can proceed to the Delhi CET 2019 Application Form filling procedure. We are providing tentative Delhi CET 2019 Exam Dates. These dates are based on the schedule of Delhi CET 2018. To get the latest update about Delhi CET 2019 Exam Dates you are advised to visit the official website regularly. All the interested candidates can fill the Delhi CET 2019 via online mode. Candidate can apply only for one test from the given options. To fill the application form you need to full fill all the criteria for that particular test. Delhi CET 2019 Registration process has been divided into three steps. In the first step, you need to fill registration form, in the second step they need to upload all the required images and at last step you need to pay the fee. In the second step, applicants are required to upload the scanned images of photograph, signature and left thumb impression. This is impressive that the exam authority is providing step by step procedure to fill the application form. You can access the procedure by going through the Official website and then click on How to fill the Application form. The direct link is given at the end of this article. Candidates can pay Delhi CET 2019 Application fee through online mode and Offline mode. Through online mode, you can pay using Net Banking, Credit or Debit card. Payment can also be done through the Challan of Corporation Bank. The Delhi CET 2019 Application fee will be Rs. 400/- bank charges and service tax will also be added. Here we have mentioned the Exam Pattern of CET Delhi 2019 examination. It will help you to understand the examination better. All applicants can check the Delhi CET Syllabus from below the table. The syllabus is listed below according to the Test and course. Test 3 Current affairs, Hindi comprehension including grammar and logical & analytical ability. The CET Delhi admit card will be available online only. All the candidates who filled the application form and made the payment can access and download the CET Delhi 2019 Hall Ticket via login on the official website. Candidates have to paste/Glue a photograph on the downloaded/printed admit card. Please keep the admit card safe because you will need it in counseling process. Delhi CET 2019 Result will be provided online to students through the official website. After declaring the result a merit list will be prepared according to the marks obtained in the Delhi CET 2019 exam. Candidates will be not allowed to request for re-checking, re-assessment, re-evaluation or scrutiny of the answer scripts. Candidates have to obtain more than the required marks. Candidates from general category have to score at least 10% marks and candidates from SC/ ST/ OBC/ PWD categories have to score at least 5% marks in the Delhi CET 2019 exam. To get eligible for admission candidates have to qualify in the exam and also they need to complete the CET Delhi counseling process. The counselling process will be organized online, on the basis of merit list. All the candidates who qualified the exam will have to pay Rs. 700/- as the Delhi Counselling Fee. All the candidates have to bring the original documents and their photocopies for the verification process. The counselling process will have various parts or steps. All the eligible and interested candidates can apply for Delhi CET 2019. CET 2019 will be organized next year to offer admission in various full-time diploma courses in the field of engineering, technology, pharmacy, etc. All the interested candidates can apply for it whenever the application form will be released, But you can start your preparations from Right Now. If you want to ask anything about Delhi CET 2019 then put your comment in below comment box, we will get you back soon with your answer.